SCMRE Education programs were for the first time making a focused effort at developing Material Culture and Technology curricula for secondary school classrooms. Our long-term plan was to develop a complete curriculum package integrating the nature and utilization of materials from both the artifact and analysis perspectives. The first step in this process was the initiation of a workshop series with students selected from a local school, Suitland High School, with the emphasis on the materials used in the creation of artifacts. The first half of the series would be enhanced with another series. Plans were under development to complete an analysis aspect to the study of material culture, to be initially offered parallel to the artists' materials sessions. Eventually, the two paths would converge into a unified program of study, the curriculum for which will be available from SCMRE for all secondary classrooms. SCMRE staff began a pre-collegiate education program with Suitland Center for the Visual and Performance Arts (SCVPA). The goals of this workshop and series were to increase and diffuse knowledge through lectures and demonstrations on the nature of artifact, and on the materials and techniques for creating, evaluating, and restoring works of art. The SCVPA's goals for the project were to broaden and deepen the students' view of the world of art by working with SI specialized professional staff, to seek opportunities for the students to interact with adult professionals and to learn about traditional and modern artists' materials and techniques by working with SCMRE conservators, to have SCMRE provide lectures, and hands-on demonstrations in art techniques and art preservation, and to add new and repeatable programs to the SCVPA curriculum that can be adopted by or adopted for other academic programs at about the same level. The structure of the course included six lectures/studio sessions at SCMRE from 3:00 pm to 5:30 pm every other Tuesday. These units are: 1) painting media, 2) painting in wood (marquetry), 3) egg tempera, 4) compo, 5) paper, and 6) gold-leaf. 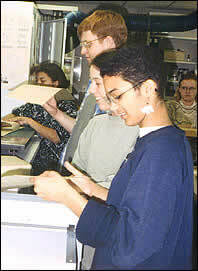 This program, a study of technology and method of artists' materials, was conducted beginning October, 1995. The content emphasized the nature and use of materials in the creation of artworks both in the past and presently. SCMRE provided studio facilities and instruction, course supplies and tools, and reference and other materials for student consumption. The purpose of these exercises was to explore the material technology of art and artifacts, to understand the nature and context of materials and techniques, and through practical studio exercises, to acquire a "feel" for the problems and opportunities of working with a variety of materials. Throughout the course an emphasis was on "looking at things," that is, the employment of observation and knowledge to understand the character of artifacts: what they are, how they were created, what their condition is, what problems lie in their future. We hoped to change the way students think about the things around them; art and artifacts, everyday things, even their own work, and to introduce and employ the systematic approach to problem-solving as it relates to creating and preserving cultural materials. Following the conclusion of the SCMRE series, students will employ their new knowledge of materials and techniques to create artworks of their own choosing. Later in the school term an exhibition of these works will take place, with critiques by faculty of the Suitland Center for the Arts and SCMRE staff. Painting Media - Along with concept of making painting, the good craftsmanship is equally important. Each painting techniques has few fundamental rules for proper physical construction. Within theses rules, there are a broad range of manipulation depending on the painting media. Without the understanding of painting media, the painting will not survive well. In this section, traditional oil paints and the contemporary acrylic paints were the focus of study. Exercises were made to further the understanding of each paint's unique properties, both working and stability. The benefits and drawbacks of each paint were discussed and this will allow the student to make better informed decisions. "Paintings in Wood" (marquetry) - The technique and practice of creating polychrome pictorial images in wood veneer dates back centuries. The process begins with the selection (or creation) of the image to be achieved, followed by the selection and assembling of the wood veneer stack from which the image will be cut using a jeweler's saw with thread-sized blades.demonstration and execution of the image. Suitland students completed the exercise of cutting out the images, selecting image elements for among the pieces cut, and assembling the jigsaw puzzle-like final product. Egg-tempera paintings on wood panels - This traditional painting technique can be traced back to the twelfth century. The painting technique lends itself to a delicate and subtle process, which is capable of highly detailed and complex visual development. Examples of egg tempera painting on wooden panel can be seen in museums and galleries today, and most of them have survived in good conditions. The section starts with preparing panels from raw wood through the finished, ready-to-paint gessoed surface. A demonstration of tempera techniques led the student to execute a self-portrait in the Italian Renaissance style. Composition ("compo") - This versatile decorative sculptural material, a mixture of animal glue, linseed oil, and chalk, gained widespread prominence as an alternative to carved wood or cast plaster ornaments. The exercise included creating molds from decorative objects, mostly carved elements, from modern silicon rubber. Once the molds had cured, compo castings were pressed into the molds and the completed compo elements were complete. These castings were used in the following gilding session. Paper and Bookmaking - With help from a SCMRE-produced commercial video entitled "Rescuing Records: Recognizing Problems in the Preservation of Documents," students reviewed the different ways paper can be made (hand- vs machine-made); how to identify the different types of paper substrates, media, and book formats; and the different ways paper and books deteriorate. In the workshop, the students learned how to identify paper characteristics like fiber type (using microscopes), and watermarks and grain direction (using raking and transmitted light). Each student was given a vat with a specific type of pulp slurry (cotton, bast, groundwood...) with which to cast paper on molds having two different screen impressions (laid and chain, and wove). (Teaching with Paper-making) The papers, decorated with additives of flowers and seeds, were dried by air-drying (which can cause paper to curl) and by press-drying (which produces flat paper). The students were next shown how paper could be bound to make different kinds of books and albums, using book sewing frames and various bookbinder tools. Finally, they were shown how to preserve their papers and books by making enclosures such as folders, mats, polyester film encapsulations, and four-flap book boxes. Gold leaf - The compo elements created in a previous session served as the foundation for applied gold-leaf, or gilding. The elements were applied to wood, and gilded surfaces were created, beginning with preparation of the grounds by application of gesso and bole (special gilding clay mixed with animal glue)through the final burnished appearance with traditional water gilding techniques.